The Boca Grande Historic Preservation Board held its monthly meeting on Wednesday, August 8 and approved all of the items on the agenda. 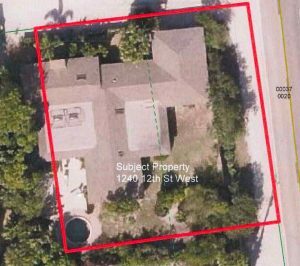 The first proposal was a request to construct a new pool and install a new sand-set paver pool deck and patio at 1240 12th Street W. in Boca Grande. A circular, in-ground pool currently exists on the property. The proposed pool is rectangular. It will be 12 feet by 24 feet for a total area of 288 feet. Because the proposed pool is in the same location as the previous one, the change is minimal are therefore creates very little impact on the overall character of the property. The pool is compatible with the nature of the Historic District and the Boca Grande community. Lee County Planner Peter Blackwell said staff have reviewed the proposal and have made a finding that the proposed pool and paver deck are in compliance with the Design Guidelines Manual for the Boca Grande Historic District. Blackwell recommended that the Board approve the special certificate of appropriateness for the subject property pursuant to the Land Development Code Chapter 22. A motion was made to approve and it passed. The second item on the agenda was a request to replace the existing fences at 360 Gilchrist Ave. The fences would be replaced with 41 feet of five-foot high wall on the western boundary, 33 feet of new six-foot wooden fence on the east boundary, and 43 feet of five-foot high wall and 98 feet of new six-foot wooden fence on the northern boundary. The applicant has also proposed to reverse the slope of the roof of the existing carport and shed. Blackwell said Lee County staff finds the proposed construction conforms to both the Boca Grande Design Guidelines and Chapter 22 of the Land Development Code and recommended that the Board approve the request. The third item on the agenda was a request to install a single fabric and metal frame awning over an existing window to match the other awnings at Michael Saunders & Company, located at 420 E. Railroad Ave. The final item on the agenda was a request to amend a previous approval to delete a southern addition and reduce a northern addition to enclose an existing breezeway and covered porch at 121 Gilchrist Ave. The house was originally built in 1927 and is described by the Lee County Property Appraiser as a six-bed, four-bath structure. A pool is located to the east of the main structure. The subject property is a contributing site within the Boca Grande Historic District. Any changes to the contributing property are required to be consistent with the Secretary of the Interior’s Standards for Rehabilitation. Blackwell said staff finds the request was fine because it is reducing what was previously approved, and rather than increasing the footprint of the building, they are simply enclosing it. He recommended that the Board make a finding that the proposed deleted south addition and the revised enclosure are in compliance with the Secretary of the Interior’s Standards for Rehabilitation and Chapter 22 of the Land Development Code. The public was invited to bring forward items for discussion. No one stepped forward to speak. The next Boca Grande Historic Preservation Board meeting is planned to take place at 10 a.m. on Wednesday, Sept. 12. The agenda can be accessed via leegov.com/dcd/events approximately seven days prior to the meeting.